In Operation Blue Light, the largest single troop movement in history, the 25th moved 4,000 troops and 9,000 tons of equipment in 25 days to the Northwest sector of South Vietnam firmly establishing a fortified enclave from which the Division could operate. The 2nd Brigade in Cu Chi stood between the Viet Cong strongholds in Cambodia and Saigon, the seat of the South Vietnamese government and the prime object of attack. Two hundred and fifty miles north of Cu Chi, the 3rd Brigade task force at Pleiku made history by opening the Viet Cong controlled Highway 19, allowing tons of vital cargo to flow through. In January and February 1968, during a truce for Tet, the Vietnamese New Year, a desperate enemy launched his all-out offensive in a dramatic attempt to regain the ground and influence that Tropic Lightning and other allied forces had taken. Moving rapidly into the path of the main units assembled for the attack, Division soldiers absorbed the full force of the enemy blows and then counterattacked viciously to smash the offensive. Through the summer of 1968 the enemy withdrew to sanctuaries across the Cambodian border and into the triple canopy jungle North of Tay Ninh City. When the next attack came, Tropic Lightning slashed back. The First Brigade smashed the attacking forces at Tay Ninh and Fire Support Base Buell then cut through the Ben Cui rubber plantation and forced the enemy back through the fog of Nui Ba Den. Again North Vietnamese soldiers hammered at the 1st Brigade at Ben Cui and again the Brigade retaliated with killing accuracy. For four nights Division troops repelled enemy attacks on Fire Support Base Buell meeting the communists at point blank range. On September 20, the devastated remains of eight NVA Regiments staggered back from the line of contact leaving more than 2,000 dead. Tropic Lightning troops returned tired and dirty to the base camps. "Tropic Lightning" dealt several more decisive blows to the enemy in the final months of the war. In one of the most stunning defeats dealt to the enemy, the 25th captured the supplies the NVA had smuggled into the country to support their plan to mount an offensive against the newly stable government of the Republic of Vietnam. The Division pursued the enemy across the Cambodian border on search and destroy missions. The last Tropic Lightning units withdrew back to Vietnam by the end of June. In December of 1970, Tropic Lightning began its return back to Schofield Barracks carrying with it 22 Congressional Medals of Honor, making it the second most decorated unit of the war. The predawn silence is broken by the clicking of igniters and the whoosh of turbine engines from a hundred helicopters. The rhythmic wop, wop, wop, of the rotor blades builds, blends, and beats the air to a frenzied roar as a hundred Hueys take flight into a rising tropical sun. A combat assault is under way. Anticipation, fear, worry, excitement, and the host of feelings only the veterans will ever know fill each soldier's heart. The short ride to hell is too long, and never long enough. Will I die today? Will my friends make it through? Will I measure up? Five miles out we see smoke in the landing zone. The Artillery preparation of the LZ is done, we are going in before smoke clears. The Huey's nose pitches up as it decelerates to land, the steady wop wop wop is now spiced with the lighter more worrisome crack, crack, crack-crack-crack of incoming enemy rifle fire raising the tension another notch. Dust and smoke fill the air. The smell of cordite, gunpowder and phosphorous of the smoke grenades fills nostrils flared in anticipation of the fight. The combat assault is underway. With a firm jolt the aircraft squats on the ground, the troops are off and running for cover, the aircraft comes up to a hover, the nose dips as it gathers airspeed and is off again into the sky. The insertion is over but not the battle. For the infantry, it has just begun. “The sun will seep along its westward path and the darkness of night will prevail upon vigilant eyes…Eyes which know the ugly face of death, know the end results of an aggressive tyrant, know the rewards of a world where choice and freedom dictate the way of life. This is a story of the 25th Aviation Battalion, the air arm of the 25th Infantry Division, written by the men who wore aviator and crew wings and the “Tropic Lightning” patch. It's also a story of dedication, determination…and courage. 1 “The Twentyfifth Infantry Division, Tropic Lightning 1965 to 1970”, by Turner Publishing Company. The distant `wop, wop, wop' of rotor blades raises spirits. High above the aircraft passes drawing enemy fire. The acrid smell of phosphorus…Smoke obscures the scene. The chopper begins a sharp turn, drops like a hawk on the wing. The sound of the rotor increases, suddenly the bird is here. The soldier is carried quickly into the waiting bird. Dust again as it lifts off, precious cargo in it's bay. The `Medevac' became the signature mission of the war in Vietnam, the hallmark we would all remember. They called Cu Chi “Hell's Half Acre” because of the fierce fighting that took place where the 25th Infantry Division established its base camp. Before the “Tropic Lightning” arrived, Cu Chi was a sanctuary. The Viet Cong came to the Cu Chi area to rest and relax after battles in the field. It was a good base of operations for “Charlie,” only 25 miles Northwest of Saigon. Other soldiers had passed through the area but none had attempted to stay. And when the 25th Infantry Division tried to do what no other division had yet done, they found that it was not an easy assignment. Stories of the valiant “Tropic Lightning” soldiers in Vietnam are reported in many books and articles. One is the story of Danny Fernandez, a rare young man admired by his contemporaries - quiet cheerful, competent, unselfish. While on a search and destroy mission with C company, 1st Battalion (Mech), 5th Infantry, Fernandez and his buddies were in a battle position when a grenade came flying in. Fernandez immediately jumped on it and covered it with his own body, shielding the others from the blast. 2 “Angel's Wing” by Joe Finch copyright 1996.
diminutive 4 feet 11 inch Ron held onto a bolting pilot just long enough to ensure he did not get hit by a rotor blade or debris as the aircraft came to rest. Leonard Sugimoto and Michael Drake continued to fly in spite of their personal conviction that their next night mission would be their last, and unfortunately that was the case. They died trying to re-supply an infantry firebase at night. George Grinell flew repeatedly into hostile fire on many occasions earning every medal for heroism but the Medal of Honor. His performance as a gunship pilot was legendary. He had a natural feel for the helicopter and could somehow sense a tactical situation after a few brief words on the radio. The Infantry he supported decorated him with, Distinguished Flying Crosses, Silver and Bronze Stars, Air Medals, and even gave him a Combat Infantryman's Badge. The history of the many heroic air crewmen of the 25th Aviation Battalion began in Hawaii in 1963 with the “Shotgun” riders. Today, the story and the name are nearly forgotten. They were called “shotgun riders” from the Wild West days when guards with shotguns accompanied stagecoaches on cross-country runs. Col. Sam Kalagian, (Black Sam) the Commander who deployed with the 25th Aviation Battalion to Vietnam recalls, “ They took infantry men who had proven they could shoot well and sent them to Hawaii for 90 days temporary duty at the `Door Gunner School' and then deployed them to Vietnam”. They rode “shotgun” for helicopters in Vietnam from January 1963 to January 1966 when the Division itself deployed to Vietnam. “Shot gunners” - or officially, Aerial Door Gunners - were tough, skilled soldiers who, in the tradition of their counterparts on the stagecoaches of the old West, protected their UH-1 “Sky-coaches” while flying over South Vietnam. It was Fall of 1962 when the U. S. Military Assistance Command, Vietnam, asked the Department of the Army for help in protecting the troop-carrying helicopters being used to fight the Viet Cong. By January 1963, the 25th Infantry Division had responded to the call and had sent the first group of 100 volunteer Aerial Door gunners to Southeast Asia. Three years and 2,200 men later, the “Tropic Lightning” Division's highly regarded “Shotgun” program came to a close. Its members had compiled an enviable record of combat in a modern application of the stagecoach shot gunners of Wild West days. They developed the tactics that became a signature of helicopter missions in Vietnam. On 22 August 1965, a quiet, Sunday morning at Schofield Barracks, more than 170 fully equipped men were assembled, roll was called, then all were hustled into waiting buses. Forty-five minutes later: Pier 40. The proud company banner, Charlie Company 65th Engineer Battalion was carried aboard the Military Sea Transportation Service transport, General Edwin D. Patrick, destination - Southeast Asia. A few hours later, the Patrick sailed out of sight. The engineers landed 7 September 1965 at Cam Ranh Bay, a former French resort area, found little to be reminiscent of home, other than the attitude of the friendly, but reserved Vietnamese people. Over the next few months they made their way by truck to Cu Chi where they helped elements of the 25th Infantry Division establish a forward base at Cu Chi. The 1st and 2nd battalions of the 27th Infantry, Wolfhounds, provided security while the 65th Engineers graded, bulldozed and constructed a Divisional base camp. The 25th Aviation Company originally activated at Schofield Barracks in 1957, was reorganized and re-designated as the 25th Aviation Battalion on 12 August 1963. As the Division prepared to deploy to Vietnam in 1965, the staff recognized the need for more modern aviation assets. What became A Company 25th Aviation Battalion (Little Bears) was formed out of assets of the 175th Aviation Company which had been formed at Ft. Benning, Georgia in 1965, as part of the 11th Air Assault Division, an experimental unit formed at that time to test air mobility concepts. Early in February 1966, the 175th shipped to Hawaii and then to Viet Nam. That was a non-trivial exercise, as everything had to be disassembled and readied for shipment by sea, protected against corrosion and bad weather but ready for quick assembly. While in transit to Vietnam, 30 April 1966, the assets of the 175th were turned over to A Company. On 5 May 1966 the 175th Aviation Company was inactivated. Company B (Diamondhead) had largely deployed to Vietnam with their own equipment on the cargo ship “Chetis Bay”, leaving Hawaii on 16 March 1966 and sailing straight to Vung Tau, Republic of Vietnam (RVN), arriving on 23 March 1966. Company A, (Little Bears) would serve as the division's assault helicopter company, and Company B, (Diamondheads) would perform in an attack support role. The 25th Aviation Battalion was deployed to Vietnam led by its Battalion Commander LTC Samuel (Black Sam) Kalagian. Movement of the (parent) 25th Infantry Division to RVN actually took place in the Dec. 65--Jan. 66 time frame and initially involved only the 3rd Brigade which was flown directly from Hawaii to Pleiku in the Central Highlands. Over a 25-day period in December 1965 and January 1966 the Division moved 4,000 men and 9000 tons of equipment to the Northwest sector of South Vietnam. At that time it was considered to be the largest ever airlift of a military unit over such a distance. The rest of the 25th Division came in a sea-lift from Hawaii (including the 25th Aviation. Battalion) beginning in late March 66. The 25th aviation battalion arrived on 30 April 66. Col. Sam Kalagian remembers, “The Division deployed one brigade to Cu Chi in December 1965. I went to Vietnam to learn the tactics and training techniques we would need to prepare for sending our aviation assets to Vietnam. I flew with all the outfits I could. Because I had been the assignment officer, I knew where most of the guys were and how to reach them. I flew with the Tigers out of Soc Trang for a while”. "I helped set up the airfield for A Company and B Company, 25th Aviation and Troop D (Air) of the 3rd Squadron, 4th Cavalry" at Cu Chi. I helped organize the base camp area.” LTC Kalagian also took incredibly detailed mental notes concerning the situation on the ground, and what the equipment needs were for burgeoning forces at Cu Chi. As he visited various units he made arrangements for aircraft to arrive in country. He returned to Hawaii to oversee deployment of the 25th Aviation Battalion to Cu Chi. He sent the aircraft to Vung Tau to be reassembled and flown from there. He went directly to Cu Chi to help set up tents and living areas. In Hawaii LTC Kalagian had sent all his people on `scavenging and scrounging missions' to get everything they could find. Col. Kalagian remembers, “I sent people to every salvage point on the island. Anything we could use we cleaned out of every storage room in Hawaii. Refrigerators, generators, tools, wood. Even things that didn't work could be used for barter in Vietnam so we got everything. I made sure that each of our Connex containers was marked so we could identify them from the air, track and watch them. We shipped some to Vung Tau and some to Cu Chi. I kept helicopters in the air to supervise off-loading. If they saw one of our containers going the wrong way we got someone there quickly to head it back the right direction. There was a lot of trading going on in the first few days as we settled in. I think we got most of what we needed for the Battalion. The wood we had used to crate things was nice long pieces that we used to build hooches, the mess hall and some of the administrative things we needed”. It had to be a pretty wild time. They were doing all this trading and building in the middle of learning to fight a new type of war. LTC Kalagian sent his pilots, to fly OPCON (under Operational control of other units) all over the country so they could learn from all the different types of units. He also taught his Officers and men a lot about coping, scrounging and bartering to obtain the materials and supplies they needed to sustain themselves in combat. Many of his pilots were senior officers with little experience in helicopters. LTC Kalagian himself had been a fighter pilot during World War II. Cu Chi, Sam went up to northern part of South Vietnam to take the 14th Aviation Battalion and Lieutenant Colonel Edward P. Davis took the 25th Aviation Battalion at Cu Chi. When I arrived with the Little Bears in March 1966 LTC Davis was the Battalion Co and Major Gene Tanner was the Exec. Major George Young became the Battalion Exec in April or May 1966. Major Ernest Elliott was the 175th Aviation Company Commander at Fort Benning during our training there and took the Company to Vietnam. We were about half way to Vietnam when we were re-designated Company A, 25th Aviation Battalion. Major Elliott did most of the planning and building of the Little Bear Company Area. Major Elliott, was the only one of some 30 majors in the company who was properly slotted. I don't know exactly when Major Hughey Weston became the second commander of the company, but it was shortly after we arrived. Within the first couple of weeks many majors were reassigned within the battalion or to other aviation units in RVN”. Company B, 25th Aviation Battalion went directly from Hawaii with the Battalion. When they first arrived in Cu Chi they were not called Diamondheads, they were called “Bad News” and were commanded by Major Jim Vance. I don't know when they changed their name to Diamondheads and I don't know who the second commander was”. The 175th Aviation Company, led by Company Commander Major Ernest Elliot left Ft. Benning by air for Oakland, California where the unit boarded a reconditioned troop ship, the USNS Upshur. One member of the battalion remembered crossing the Atlantic on the same ship. The Upshur left Oakland on the Ides of March 1966 along with various other units bound for Viet Nam. "The Upshur dropped off army units along the coast of South Vietnam from Cam Ranh Bay to Vung Tau. "Company A, 25th Aviation Battalion disembarked at Vung Tau near Saigon on 30 April 1966 and linked up the battalion's Company B which had arrived previously." There they boarded C-130 cargo planes for the ride to Tan Son Nhut airfield near Saigon. The battalion's own helicopters which had been shipped over earlier, transported the battalion personnel from Tan Son Nhut to their new home at Cu Chi, about 25 miles to the northwest, which had been secured earlier by units of the 1st Brigade of the 25th Infantry Division. The remaining equipment was shipped overland by truck convoy, which with the vast amount of equipment and supplies was made up of some 600 trucks. In 1966 as the 25th Infantry Division settled in to the new base camp at Cu Chi, they did not realize they were establishing a secure perimeter on top of a network of tunnels of Cu Chi. They quickly discovered that somehow the enemy was able to get through the perimeter defenses with no difficulty, wreak havoc then disappear into the night eluding capture. There was a distinctive smell to the red clay mud, oil and dust kicked up on landing or take off. Whatever strange concoction Mother Nature conjured up for Cu Chi, all those who flew in or out of there remember that odor. The book “The Tunnels Of Cu Chi” by Tom Mangold and John Penycate, describe the situation, and circumstances far too vividly. The Battalion's task was challenging. The area of operations covered some 8,000 square miles of hostile jungle, rubber tree plantations and wetlands with numerous tributaries and branches of the Mekong River. There were few natural terrain features that could be used as aids to navigation. There was the added challenge of excavating this same red clay for construction projects that would become operations buildings, living quarters, a mess hall, showers, and providing whatever semblance of amenities we could scrounge in the thick of learning to fight an enemy that never showed his face. The officers and men of the Battalion proved equal to the challenge. With the aid of the engineers, they built a series of small huts called hooches made from left over wooden ammunition crates with corrugated tin and thatching used for the roofs. Some of the hooches accommodated three or four men. Some housed more. The water supply for the shower was an external fuel tank from a large airplane, fed with excess hot water from the Mess Halls. There was warm water for the first few men, a real luxury in the field. Sometime in 1966 a generator was acquired under dubious circumstances for access to electricity. That made the shower and hooches quite modern and livable. The first rainy season taught them to put raised plank walkways between the various buildings to keep their feet dry for a little while longer and help reduce mud in their rooms. In Vietnam we soon discovered there were but two seasons. The Monsoon Season, which was, hot and wet, and the rest of the year, which was, hot and dry. Several things were always a constant, the heat, the unbearable humidity, the mosquitoes that argued over who was going to eat you, and the constant mortar and rocket attacks. From the beginning of their support to their withdrawal in 1970, the 25th Aviation Battalion supported every campaign with distinction. Little Bears and Diamond Heads earned numerous awards for heroism, and gallantry in the performance of their duties. 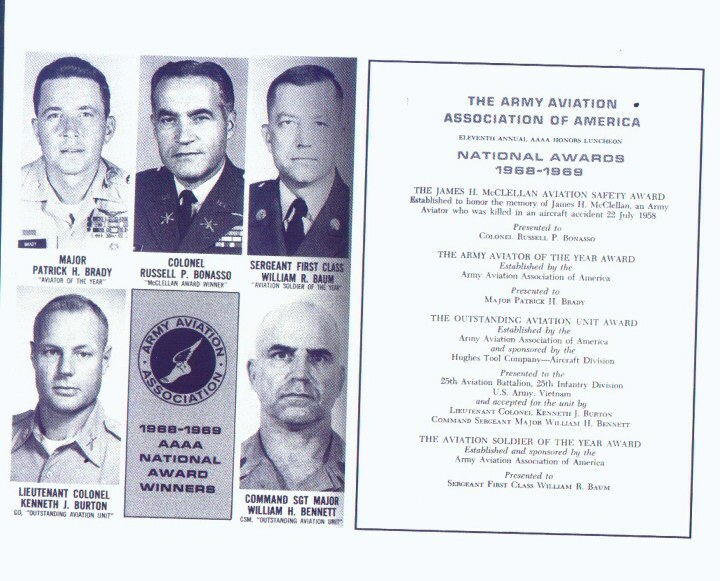 In 1969, the battalion received the ultimate award, they were voted “Best Aviation Unit In The Army” for the period Mar 68 through Mar 69. This was no easy feat with the likes of the 1st Cav and other high profile units scattered throughout the Army both stateside, and in Vietnam. The award was presented to now retired Col. Ken Burton our Battalion Commander for the time period the award covered. Below is a copy of the News Article and the award presented. The 25th Aviation Battalion participated in twelve Vietnam campaigns receiving two Valorous Unit Awards and two Meritorious Unit Commendations, the Vietnamese Cross of Gallantry with palm in recognition of those who paid the ultimate price. In addition Company B. received a Presidential Unit Citation. The 25th Aviation Battalion stood down and departed Vietnam on 7 December 1970 for Schofield Barracks, Hawaii. In their book “The Tunnels of Cu Chi,” Tom Mangold and John Penycate point out that “…of all the brave soldiers that participated in the various campaigns in Vietnam, none were braver than the air crews of the 25th Division”. THE 25TH AVIATION BATTALION and assigned and attached units distinguished themselves by extraordinary heroism while engaged in military operations on 19 July 1966 south of the Saigon River in the Ho Bo Woods, Republic of Vietnam. After two infantry platoons were helilifted into hostile territory, they made contact with well-entrenched Viet Cong units and requested armed aircraft support. Gunship crews of the 25th AVIATION BATTALION aggressively engaged the hostile forces, flying fearlessly at tree top level through intense ground fire. Despite the increasing barrage, these gallant men effectively suppressed the enemy and prevented them from inflicting heavy losses on the besieged forces. As the violent fire fight continued, transport helicopter crews selflessly braved the hostile fire and landed friendly troops within 150 meters of the line of contact. Later in the day, 25th AVIATION BATTALION transport helicopters were requested to extract friendly elements from the battlefield. Because the Infantrymen were still savagely engaged and casualties were scattered throughout the pickup zone, pilots valiantly maneuvered their aircraft from point to point, touching down within two meters of wounded men so that door gunners could quickly lift them inside. Heedless of many hits to the aircraft, the crews repeatedly descended into the ravaged zone and rescued numerous stricken soldiers. The selfless, unremitting combat support rendered by these aviators stands as an admirable example of indomitable fighting spirit and dedication to the free world counterinsurgency mission. 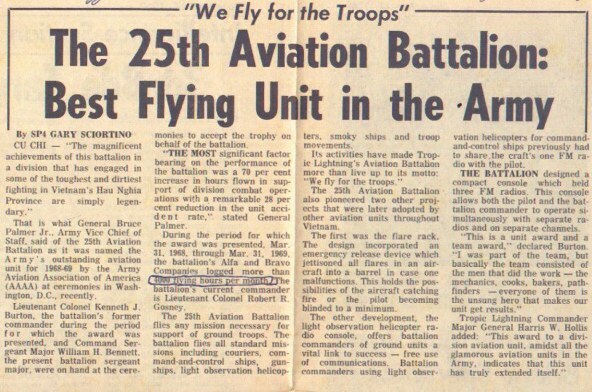 The men of the 25TH AVIATION BATTALION and assigned and attached units displayed extraordinary heroism and devotion to duty which were in keeping with the highest traditions of the military service and reflect distinct credit upon themselves and the Armed Forces of the United States.